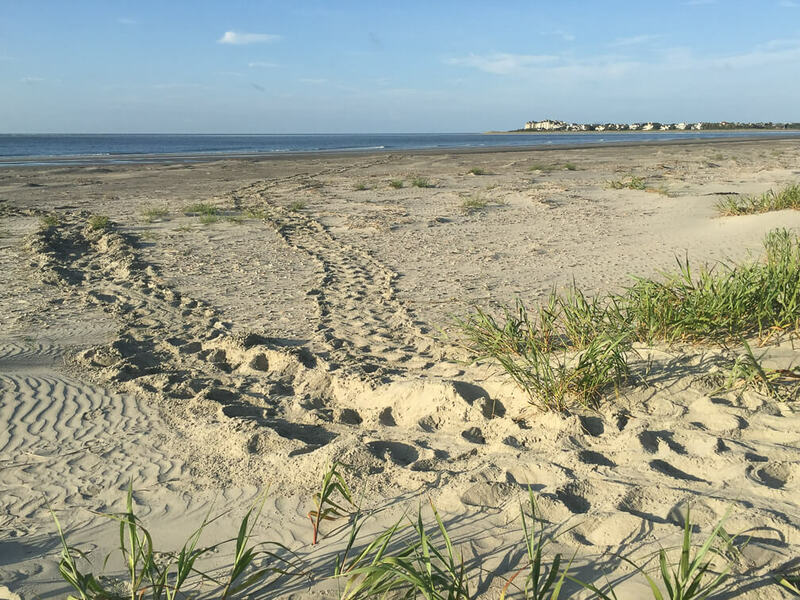 It’s loggerhead turtle nesting season, and here on Dewees we’re on target for a record-breaking turtle season, with our 17th nest discovered and marked this morning near Needlerush walk. 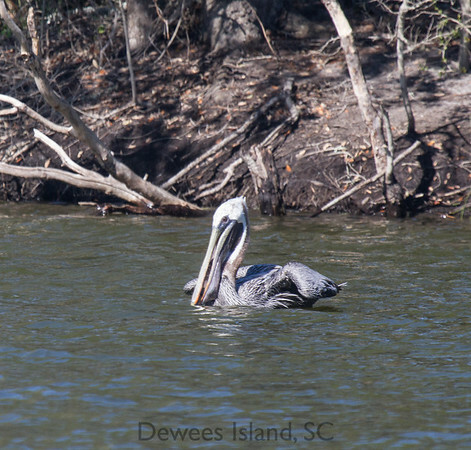 By comparison, last year Dewees had 5 nests for the whole season. Since we started the turtle protection program in 1999, we’ve seen 217 nests, with an average of 11-12 per year. 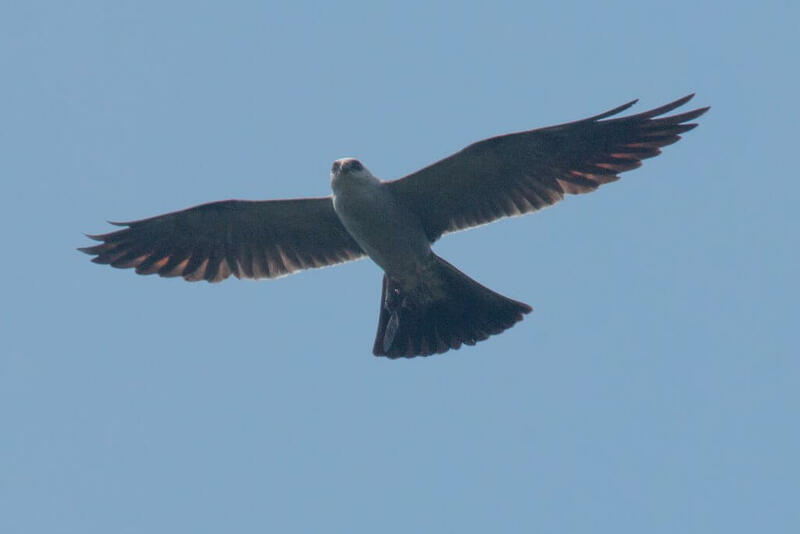 The lowest year was 2001, with 1 nest, and the biggest years were 2006, with 21 nests, and 2013, with 20 nests. Since we’re only halfway through turtle season, we will probably break the record and have the best year yet! Assuming the state average of 52 days of incubation, we should begin to see hatching nests around the 8th of July. (Don’t worry if they take a little longer, sometimes the first nests are laid during cooler temperatures and take more time.) This is a banner year for us, and we’re hearing that numbers are up across the state as well. 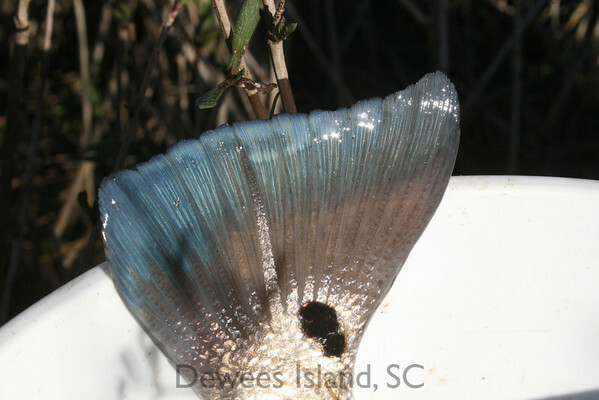 Last year the state had high numbers of nests, but Dewees had a relatively low number of nests. There are lots of factors beyond sheer turtle numbers that determine whether we have a great turtle year or a more sparse one: turtles may have a few years between nesting cycles, sand bars and natural erosion/accretion cycles make a difference, etc. Our hunch is that last year the sand bar (which brought us lots of great sand) provided a hazard to turtle navigation and they gave up when they hit the sand bars. 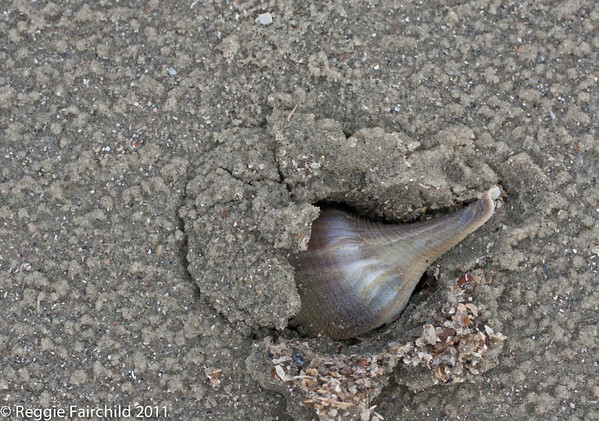 This year, we have plenty of high dunes for them to nest in, and a huge open beach with very soft sand. We take one egg from each nest for DNA testing, which enables us to learn more about the mother (the eggshell is cleaned of yolk so it contains just maternal DNA.) 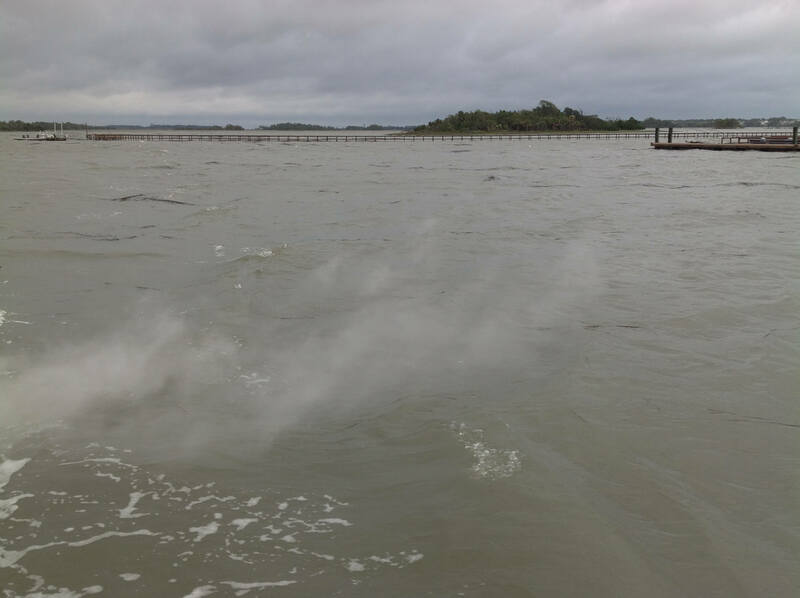 This project, through the University of Georgia, has taught us a lot about our turtles– many of the turtles who nest on Dewees also nest on Capers, Bull, IOP, Sullivans, Cape, and Lighthouse islands. 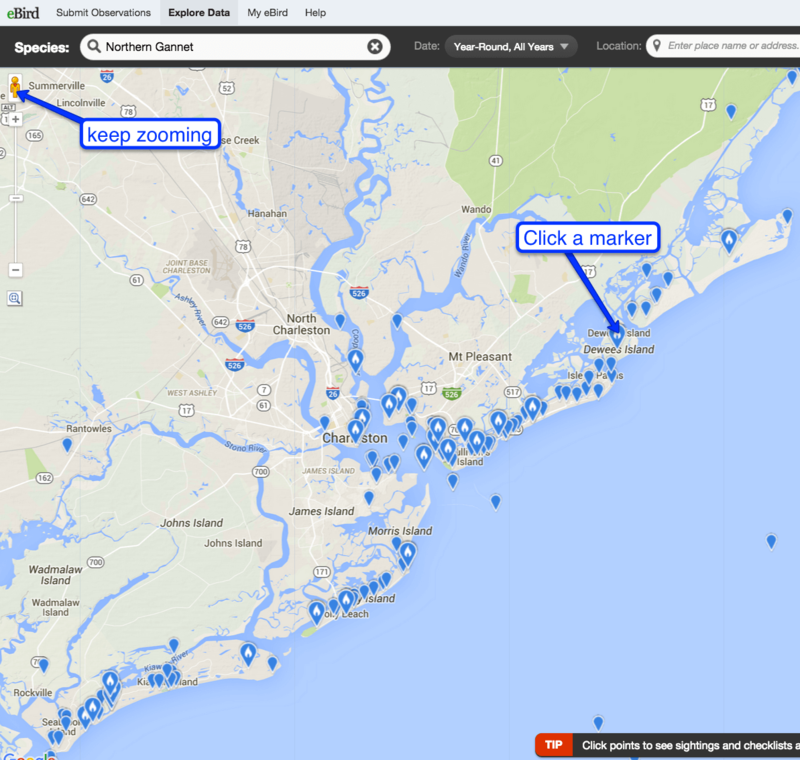 Far fewer nest to the south of us on the other side of the Charleston jetties. 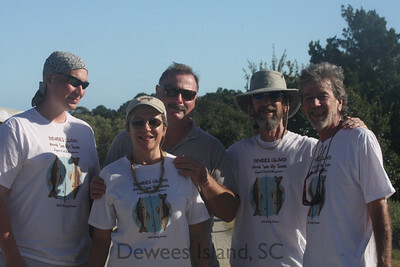 Gary McGraw, the team leader, keeps a chart of where Dewees turtles nest based on the returned DNA data. I’ll try to keep this page updated as we go through the summer with nests and predicted hatch dates. 72 hours after first evidence of hatching, we will conduct a nest inventory to see how successful the nesting was. All members of the Dewees community are welcome to join. Inventories are usually conducted in the evenings around 7:30, and will be announced on the activity calendar and on the ferry. Sometimes, during an inventory, we get the thrill of seeing live hatchlings. You can be a part of the loggerhead turtle nesting team. Yesterday, we tried to post a spreadsheet with the nesting information so far. Sorry, but something about that created a problem for the blog, so I have cut and pasted the relevant date. Eventually we’ll get that up in a dynamic form, but for now, you’ll find a chart at the bottom with the nests and predicted hatch date. 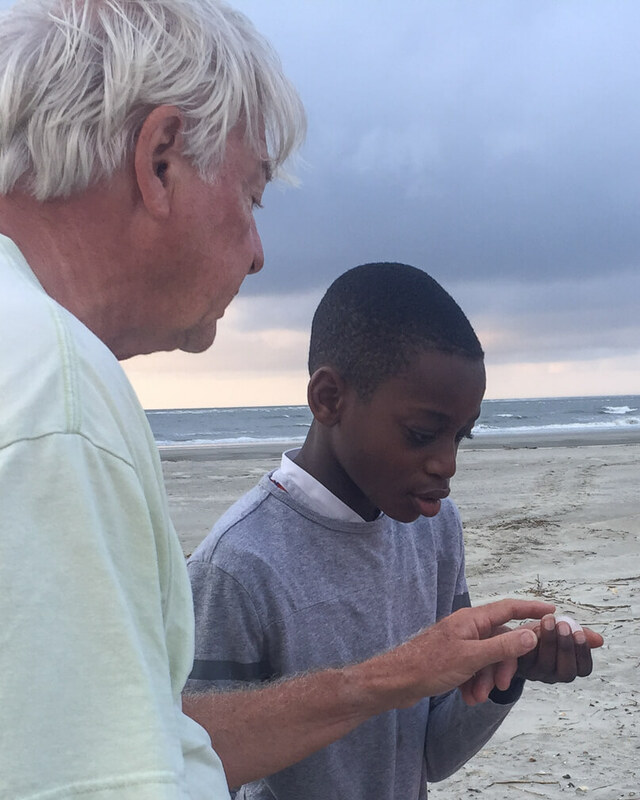 If you want to check nests near the hatching time, please let Judy or Gary know, and be sure not to use white flashlights on the beach– they can disorient the hatchlings. In addition, you can still sign up to walk in the mornings by clicking the sign-up form below. 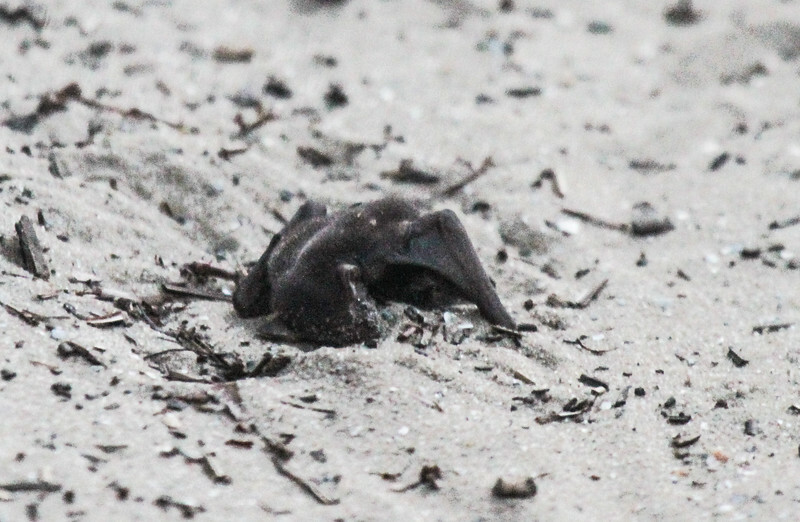 I’ve seen bats on Dewees fairly often in early spring, and occasionally in summer. Since it’s National Bat Week (who knew?!) I thought I would share a story of a lovely encounter with a tree bat in June. 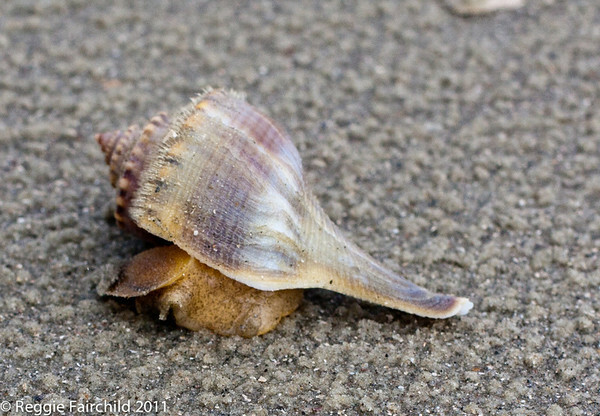 I was headed to the beach for a turtle walk slightly before sunrise through the maritime forest, and I was following what I thought was a pale winged warbler/wren through the rather dark forest, when suddenly it seemed like a pine cone fell in front of me, and a small chip broke off and fell slightly further away. 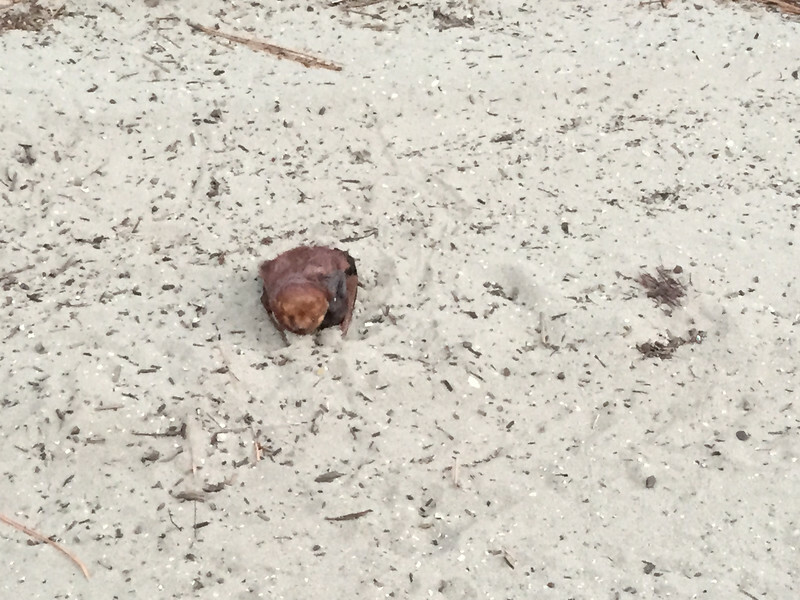 Something seemed weird, so I parked the golf cart and walked up to find a small bat with dark reddish brown wings spread out along the sandy path. 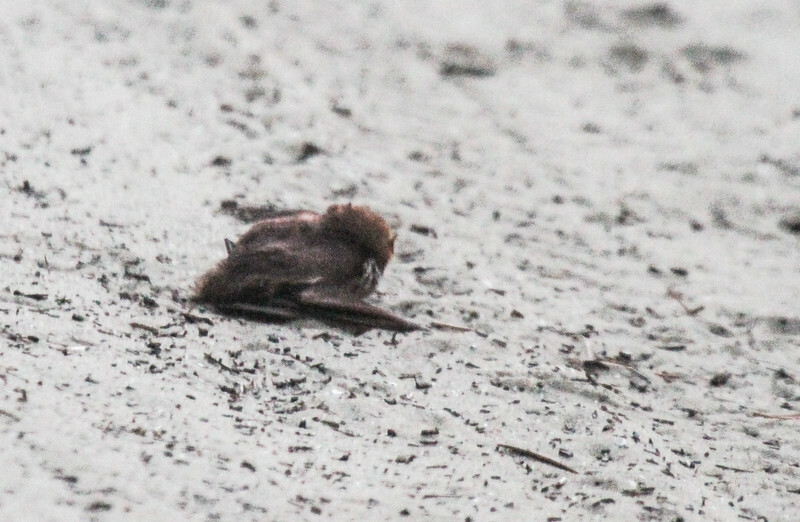 The tiny chip turned out to be a baby bat about a foot away, and the mother flew off when I got close, so I retreated about 50 feet to see what would happen. I got back in the golf cart because for some reason the birds are happier when I am not on foot, so I figured that might apply to bats. 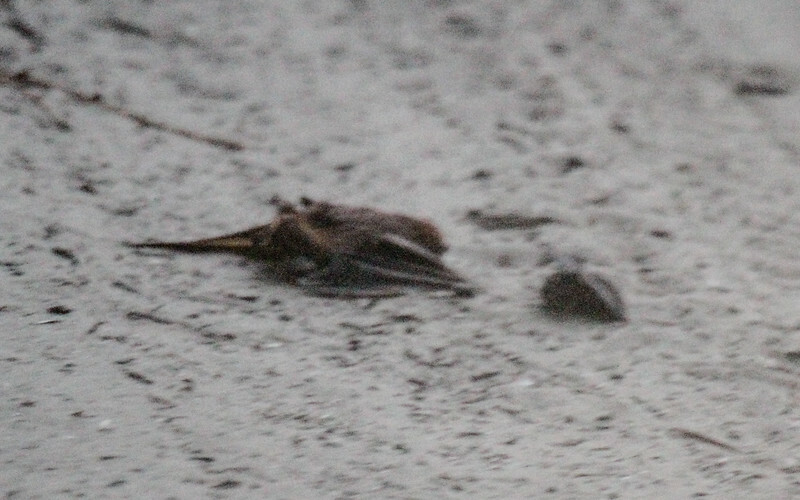 It was hard to see in the pre-dawn gloom, but eventually the mother returned and covered the baby and froze on the ground. I went closer to look and could see the small arm of the baby reaching around the mother’s neck, like a hug, and as I went for the camera she seemed to tuck it underneath and flew off with the baby. You can just barely see the baby on the right side of the photo above. I was left with a bunch of questions: What species are possible? Where do they nest/roost? What would make a bat drop a baby? Is that some ecosystem thing to worry about? I assumed that intervention would make things worse– but should I have done anything differently? The bat in the pictures is either an Eastern red bat (Lasiurus borealis) or a Seminole bat (Lasiurus seminolus). It’s kind of difficult to tell from the colors in the picture, but it looks more like a Seminole based on the mahogany colored fur. Baby bats can be born at up to 40% of the female’s body weight (!) and only increase in weight as they grow. Most tree bats (what reds and Seminoles are called) forage with their babies clinging on to them. 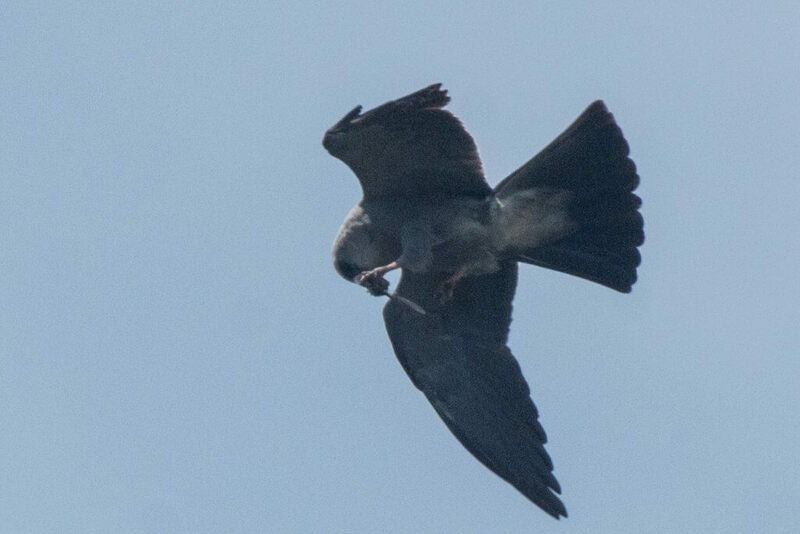 It is not uncommon for the baby to fall off the mother while she is flying and sometimes people assume they’re rabid and kill them. Finding a bat like this is nothing to worry about. 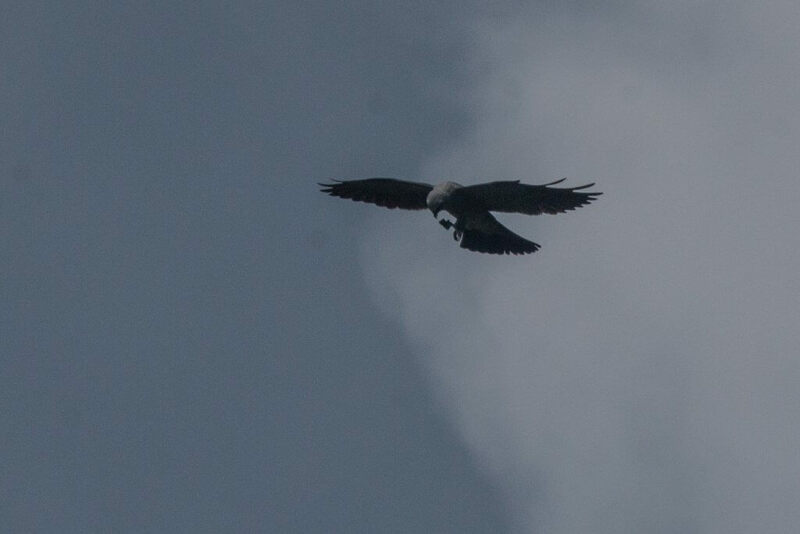 It is possible that the baby was falling off the mom and the mom was trying to catch it. It is also possible that something entirely different was happening. I’ve heard of bats occasionally falling out of trees but I’ve never seen one do it. Lasiurine bats are some of my favorites and are absolutely gorgeous! These bats tend to roost in foliage or under exfoliating tree bark. Females can have 1-4 pups, but having only one or two is more common. The IUCN Red List has them listed as a species of least concern. 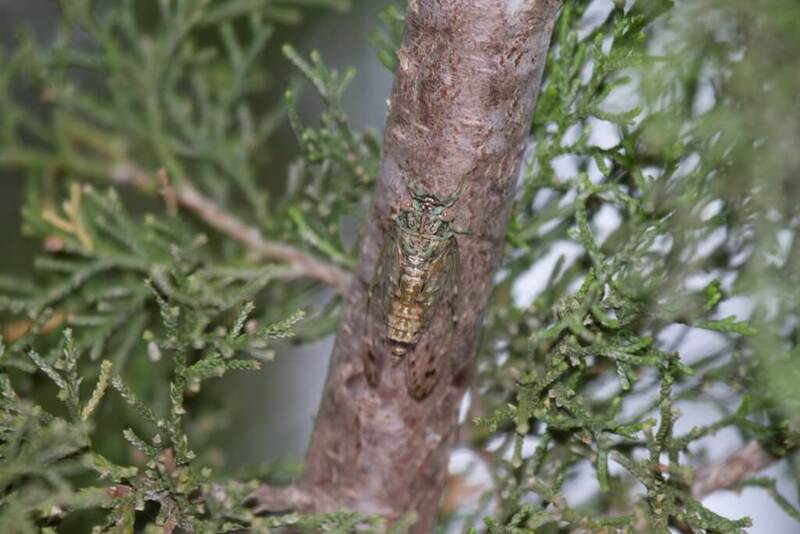 They are solitary, but sometimes nest near each other in clumps of spanish moss or pine trees. 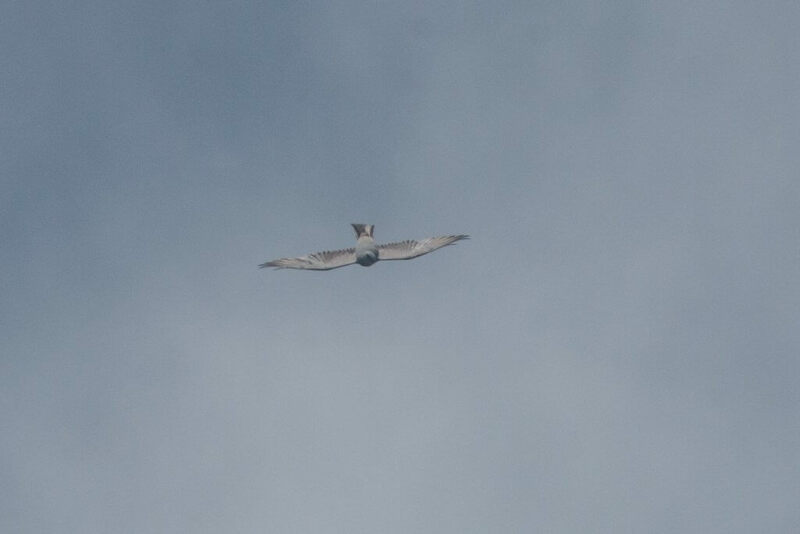 They like to roost in tall trees at the edges of open areas with clear flight paths. 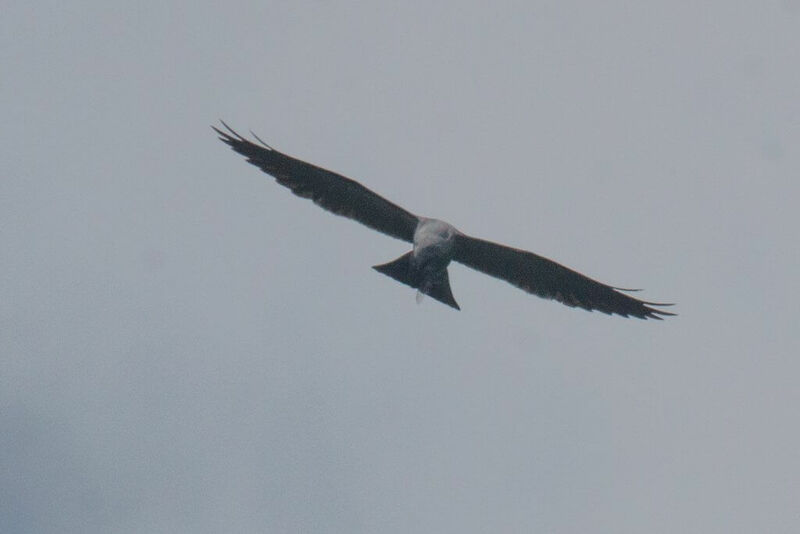 They eat at dusk, while flying, and they eat a wide variety of insects. They are also known as a mahogany bat, for the colors of their wings. They locate prey using echolocation, which has been recorded and amplified for human hearing here. Blue Jays might feed on baby bats left behind when the parents forage. 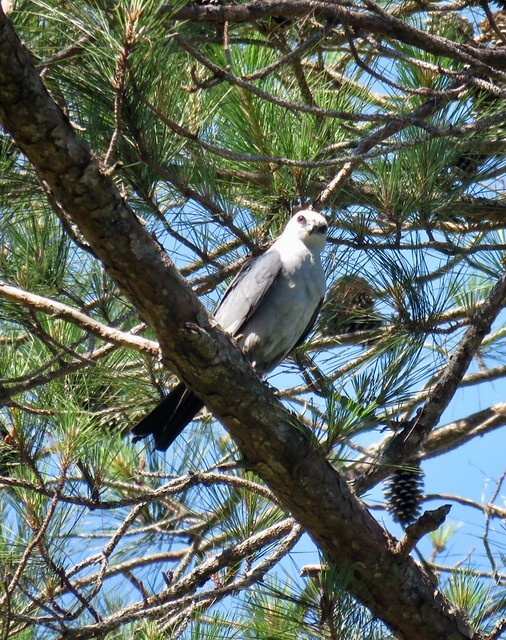 I came away from the experience with a little awe– these amazing animals are right outside our door, feeding little ones and roosting in the trees, and we are mostly unaware of them. I felt fortunate for the magic of the encounter that let me glimpse a little of that hidden life. 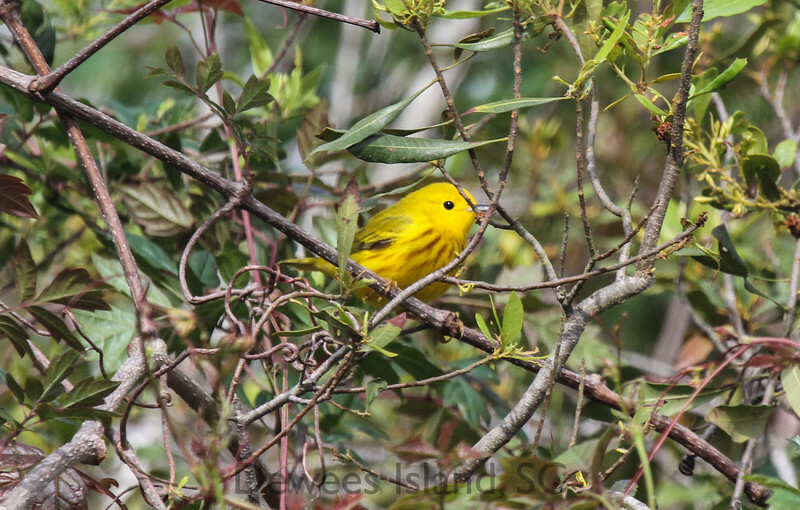 It’s migration season, and there are wonderful birds passing through. 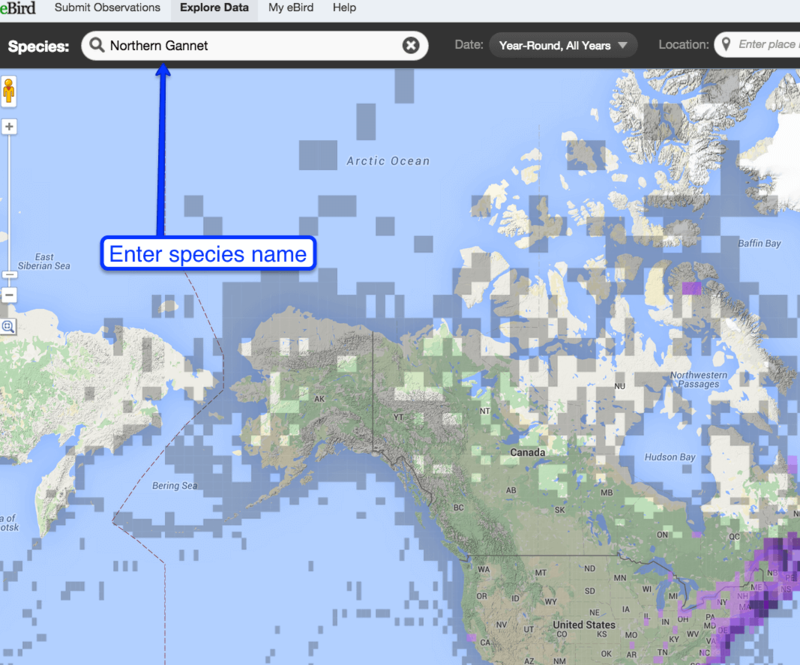 If you’ve ever wondered what you might expect to see, you can use ebird as a great resource. In fact, you can even use it to find out when the birds you MOST want to see will be on the island. 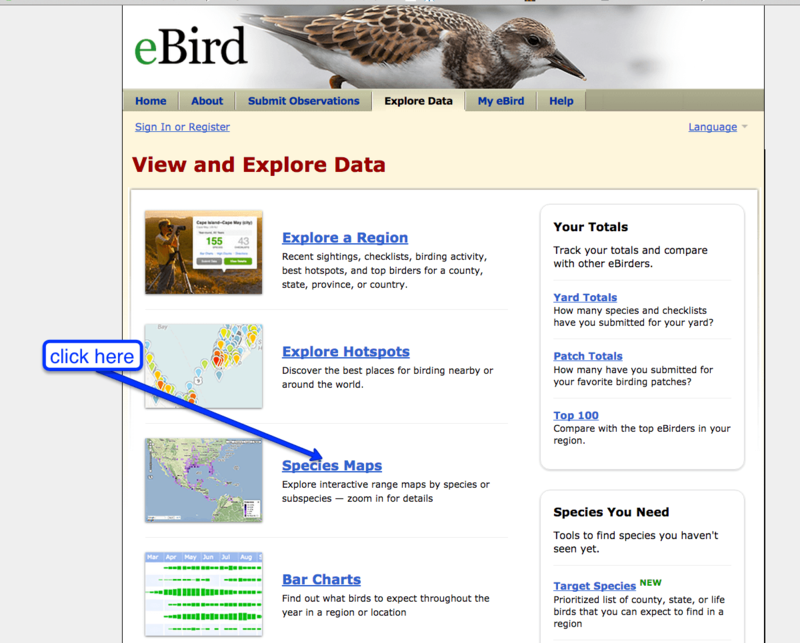 Start by going to ebird.org. 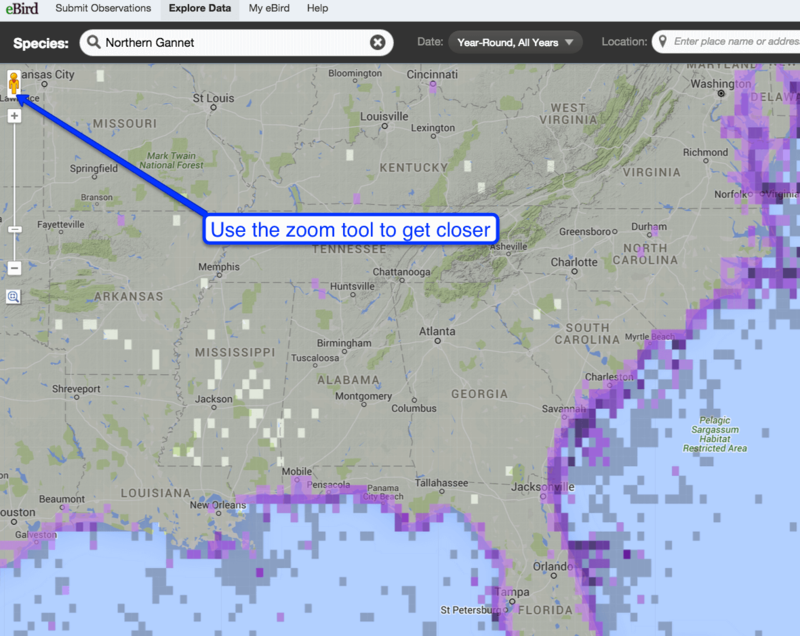 Click on explore data. Keep zooming until you can see buttons where people have entered data. Allen Mitchell caught this photo of a mink on the island last spring. 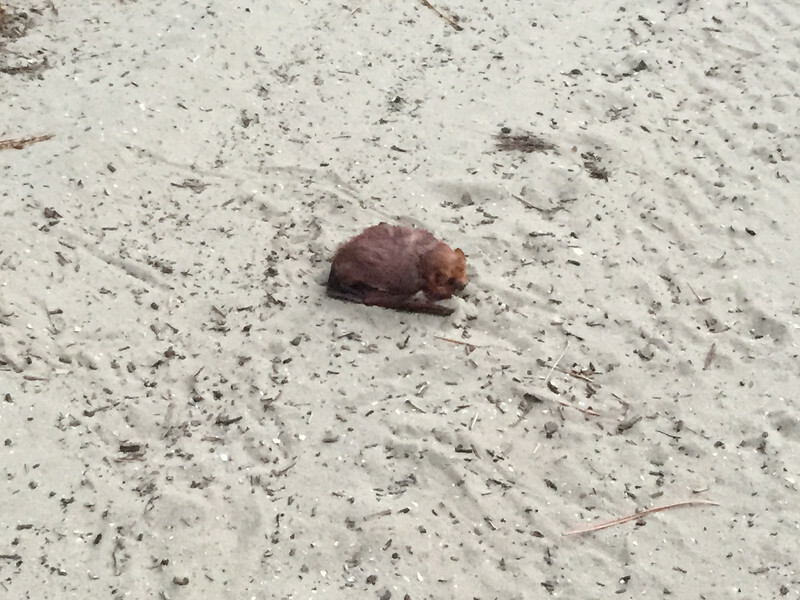 One of the mammals we have on Dewees Island is a mink, mustela vision. 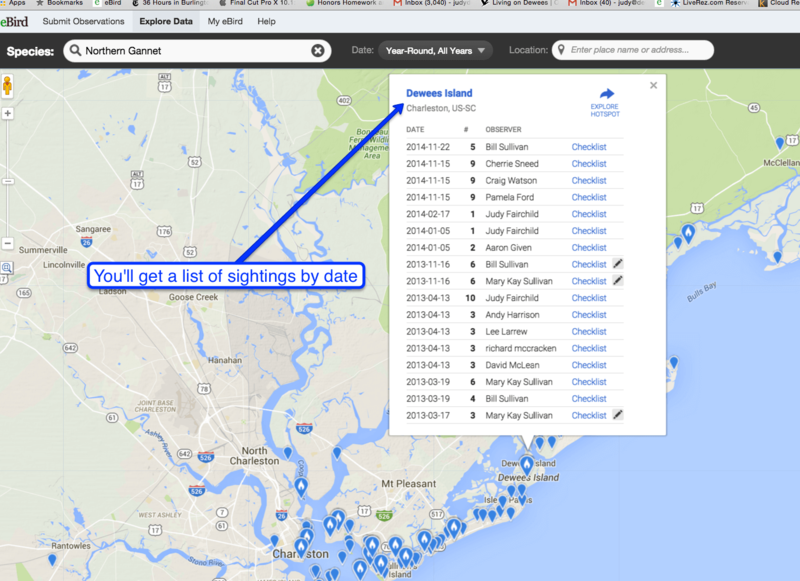 We haven’t seen them on the island very often, but sightings are on the increase here. Keep your eyes open while riding around or fishing, and you may be treated to the sight of one of these elusive mustelids. 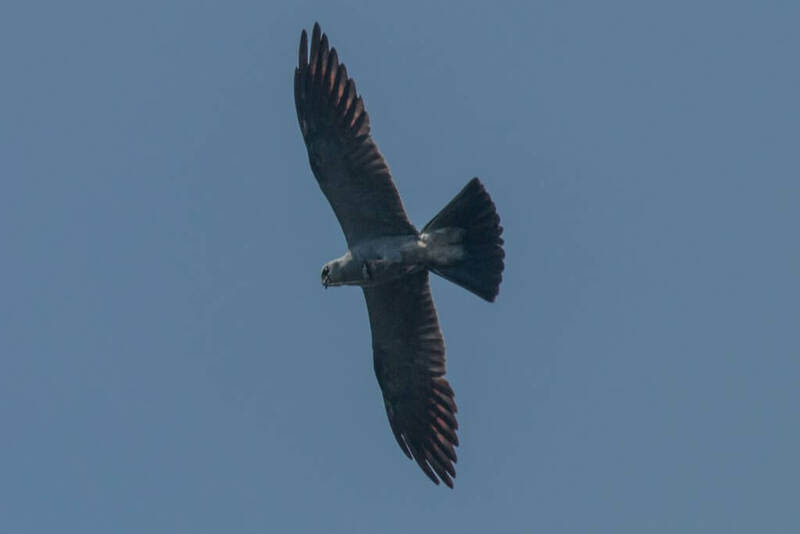 Native to North America, the species has also been introduced to Europe and South America, expanding the range (which makes it classified as a species of least concern). Hunted widely for their pelts since before colonial times, there were once two species of mink along the eastern coastline. The other, the sea mink, was widespread in the northeast, and was one of the only carnivores hunted to extinction in modern historical times. It was larger than the American Minks we have, with a larger pelt, with an estimated extinction date in the 1860’s. This South Carolina Wildlife magazine article from 2009 describes the history of the mink and efforts to assist conservation efforts in the state. That article was mentioned in this blog post of 2009. 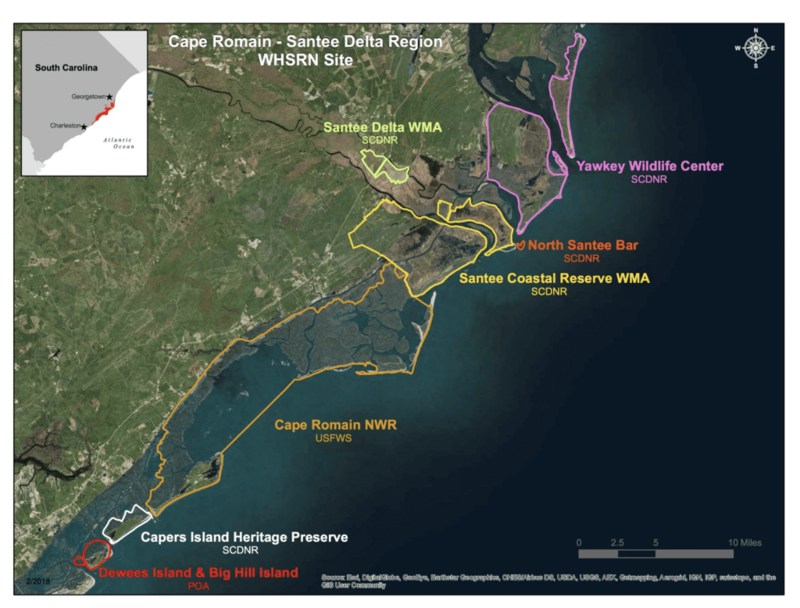 Since 1999, a DNR restocking effort has aimed at restoring the mink population along the coast north of Charleston, where mink have essentially been absent for decades. 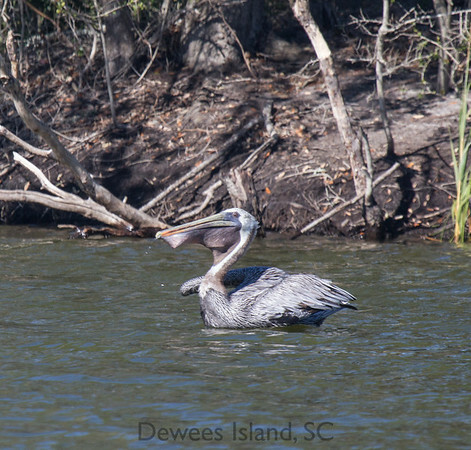 Dewees Island was a location for restocking, with at least one restocking project demonstrating the food chain in action. 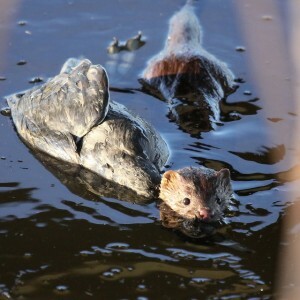 (As a mother mink with two young ones was released at the edge of the marsh, a Northern Harrier swooped down and made off with the mother, prompting Arla, the island naturalist, and Rachel, the intern, to plod through the pluff mud to rescue the young minks from certain demise. If you were there, or have photos of that, please share!) Subsequent efforts to re-establish mink populations in Cape Romain may have been so successful that the mink spread southward. 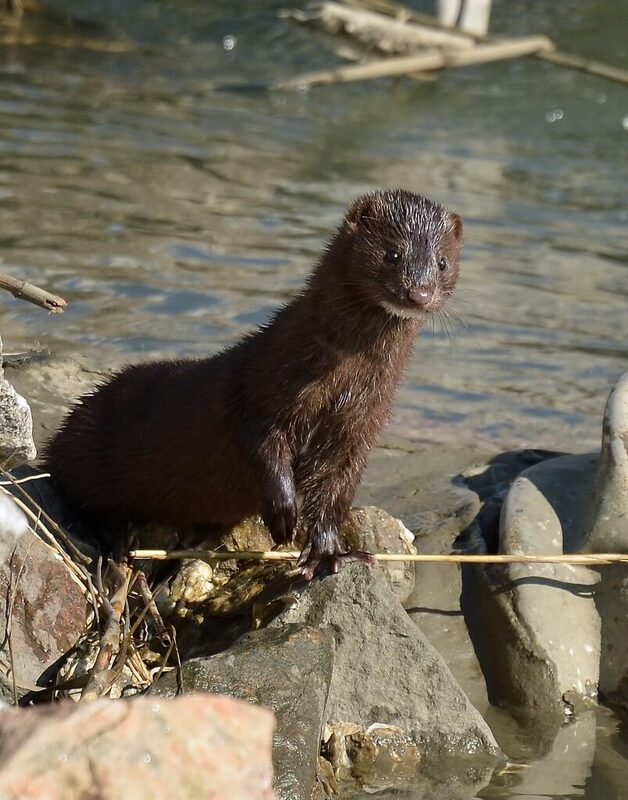 We have seen mink ourselves several times this year, at various places on the island, and many anglers have reported seeing them near popular fishing spots. 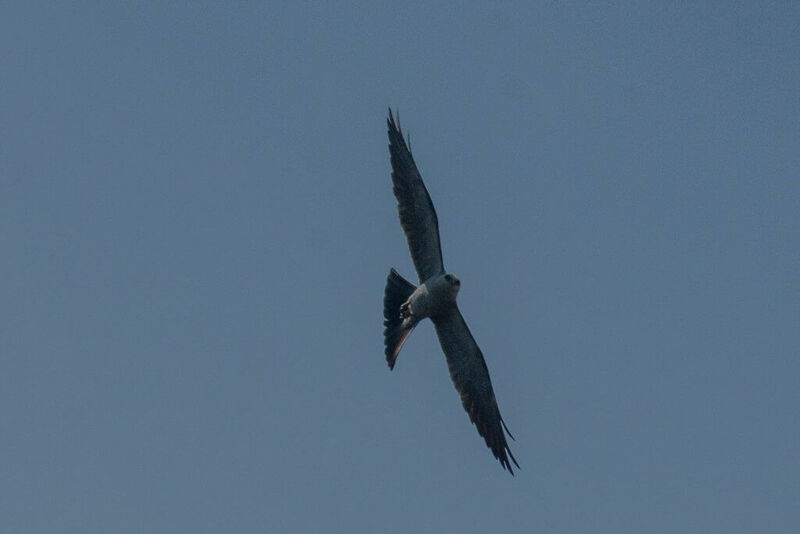 They are solitary animals who tend to be most active at dusk and dawn, although we have seen them at midday as well. Often found near water, they eat fish and small animals. 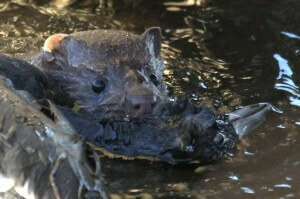 Dewees Birder Cathy Miller captured these shot of a mink at Huntington Beach state park, eating an American Coot. Major predators of mink include bobcats, foxes, great horned owls, and alligators. While hunters still take a few mink, the fur trade relies almost completely on commercially farmed mink. We had a good time watching one fish Velvet creek a few weeks ago, hopping up and down on the bank, diving into the water, catching fish, and hopping back up on the bank. I headed over there, hoping to get a photo of tracks, but there was so much wrack on the bank it was impossible. Click here to see mink tracks at the very helpful website beartracker.com. I find myself looking for mink every time I am out and about. In the meanwhile, here are the photos I took (from a distance) of the one we were watching. Feel free to comment in with details of your own mink sightings. Post and Courier: Marsh Mink returning to Coast, January 2002. 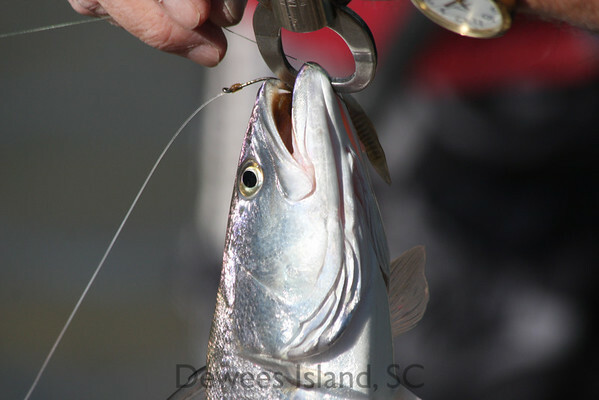 Dewees Island is a fabulous location for fishing, and catching your own is one way to avoid the sort of fish fraud detailed in yesterday’s article in the New York Times. The 2012 annual fishing rodeo is well underway on the island. My attempts to find out the story of how this started have come up empty, with a few folks chuckling and saying something like… “I might have some vague memories of that…” but that’s about it. So if you have your own stories about the fishing rodeo, please comment in on this post. Any lot owner or homeowner may participate and enter his/her team. Each team may have up to seven teammates, including the team captain. No other team can fish on another team’s registered day. I think an angler can only fish on one team per year. Teammates 15 years old and older will receive one point for each inch of eligible fish caught. 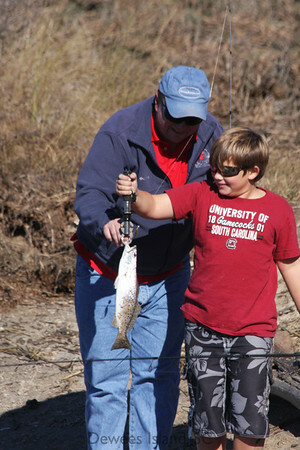 Teammates under 15 will receive 1.5 points for each inch of eligible fish caught. Each team may fish at any time from sunrise to sunset during their registered day, but the TOTAL FISHING TIME WILL BE LIMITED TO EIGHT HOURS. 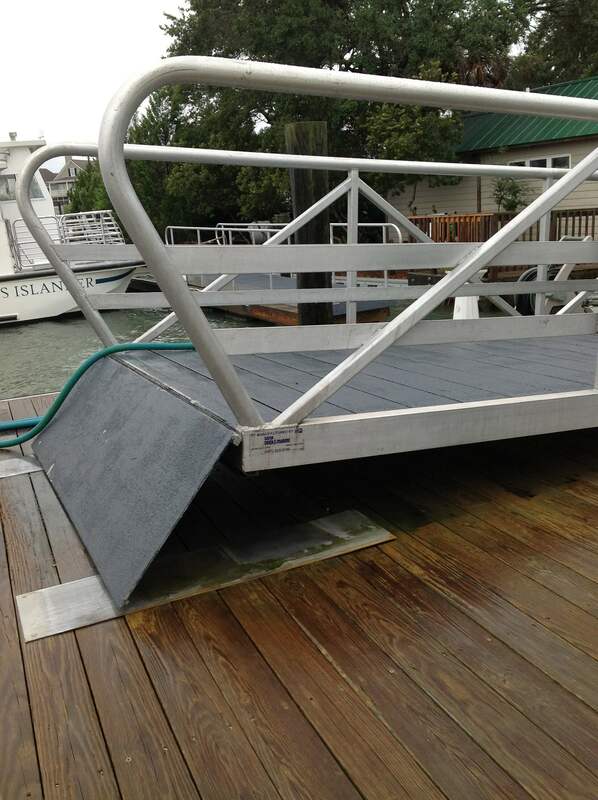 This will give all hard working anglers a much-needed break. In order to take advantage of the best fishing times of morning and dusk, a team’s eight-hour time slot can be broken up as they wish. One team may fish, for example from, 6AM-10AM, and then again from 5PM-8PM. Another team might choose to fish from 9AM-5PM. This will allow each team to choose the best tides of the day for fishing. If any team member is fishing at any time, this counts against the entire team’s 8 hours. Team spirit is encouraged. Some teams even issue t-shirts! Others gather for a meal the night before to plan out hours, bait, and strategy. Some teams appoint snack-ticians, who deliver breakfast or beer by golf cart to those hard working anglers. 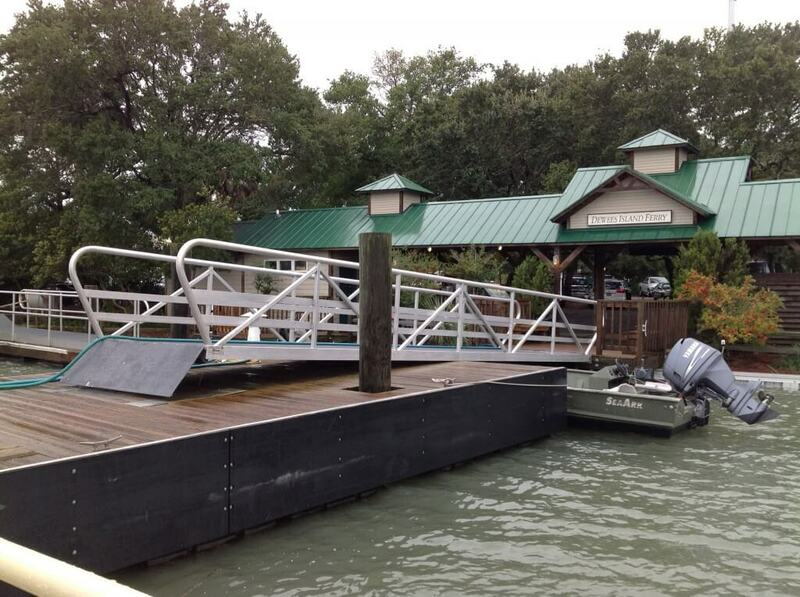 You can fish from land at any of the island’s fishing spots, including six pipes and Chapel Pond. 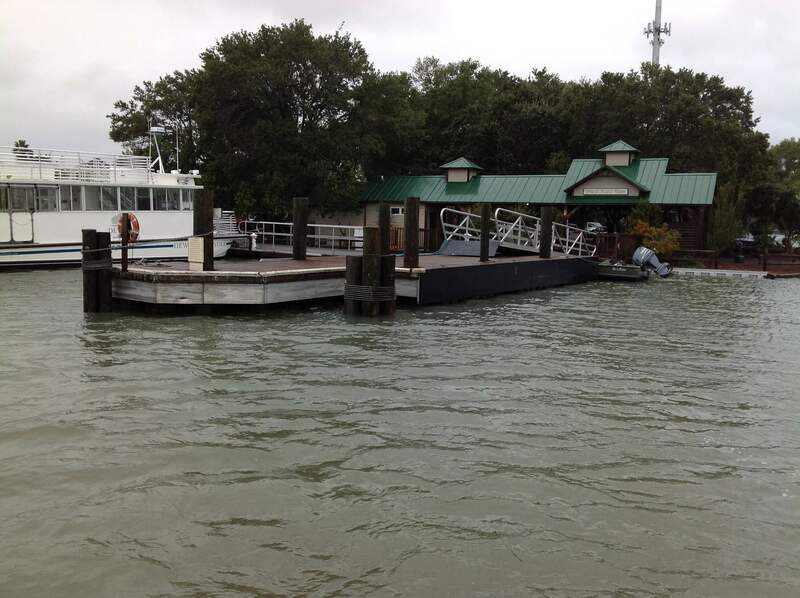 Your group can divide up to cover the ferry dock AND Big Bend dock. Each teammate will receive a scorecard to record his/her points. The team captain will tally up the team’s points and submit his/her team’s total score to Joan. The Rodeo is about fun and learning, so scorecards must be itemized and tallied. Teams who submit scorecards that aren’t tallied will be disqualified. Unusual fish or great fishing stories are encouraged to be recorded on the Captain’s Log. (and this blog!) 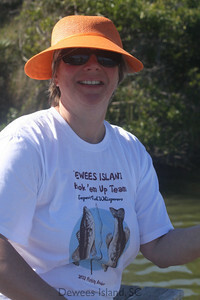 For example, this year one team was fishing at Myrtle Dock. 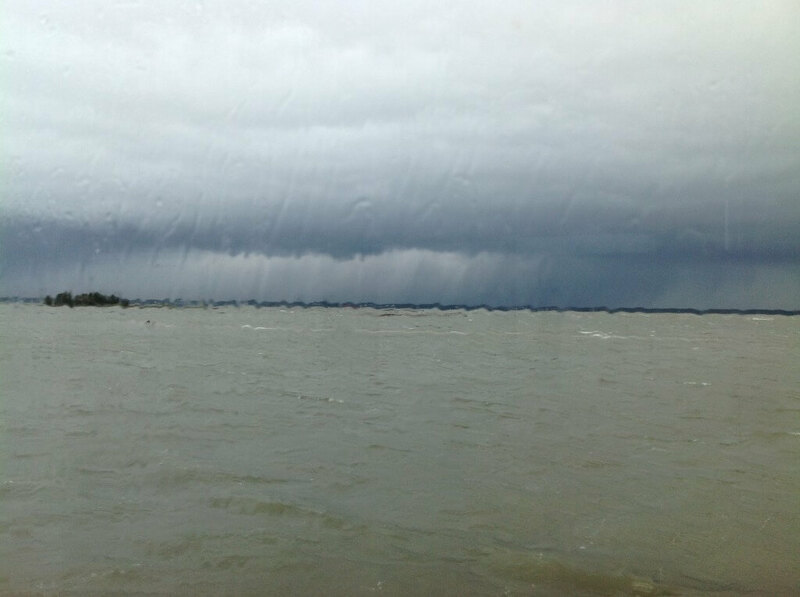 One member finally caught a fish and whipped out his iphone to record a photo. What the phone recorded was its own fall off the dock, bubbles and all. Luckily for the angler, he had his phone in a lifeproof case, and he was able to retrieve both the phone and the photo! We’d love to hear your stories about this (or previous) year’s teams and adventures. 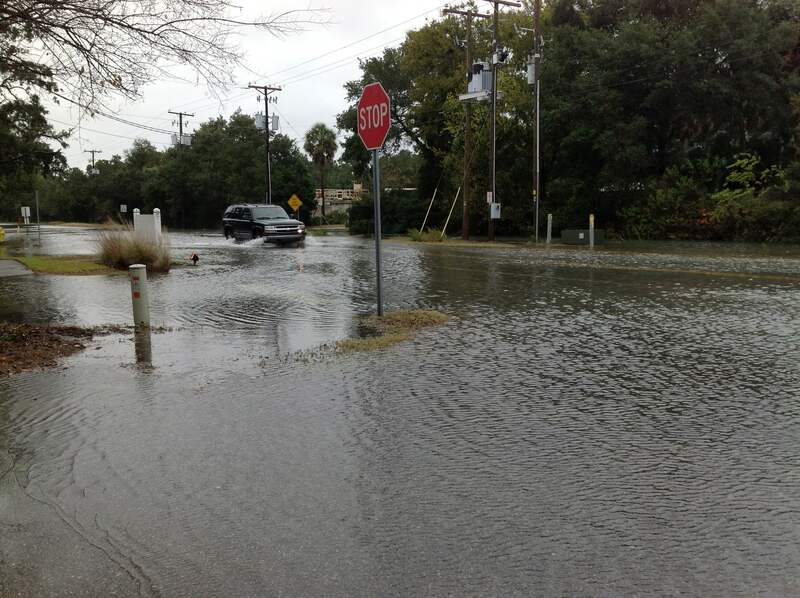 Charleston County has been under a coastal flood watch for most of the week, as a combination of astronomical high tides (spring tides, perigee moon, new moon) have coincided with days of wind from the east, pushing more water up into the marsh. 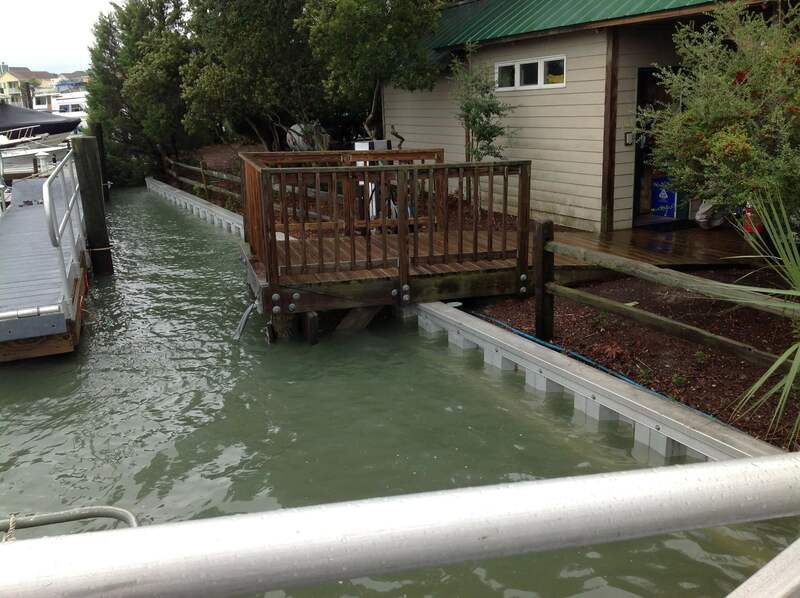 Add two inches of badly needed rain, and navigation on island roads has been interesting. Navigation on mainland roads has been even trickier– I couldn’t get out of the parking lot onto 41st street on Thursday. Since I was only headed into town for a haircut, I decided it wasn’t worth potentially damaging my car, so I turned around! Sometimes I think Pelicans are the clowns of the bird world, and sometimes I am awed by their grace. 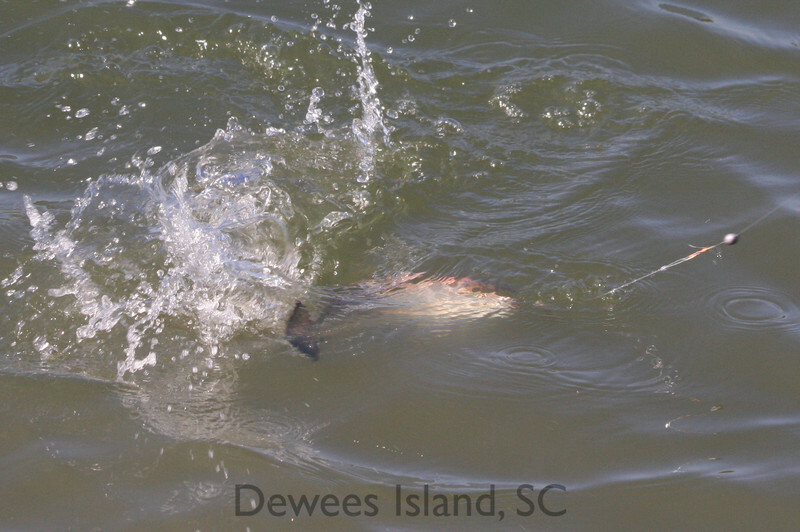 The bird featured below caught a huge red drum, and I wasn’t at all confident he was going to be able to eat it! 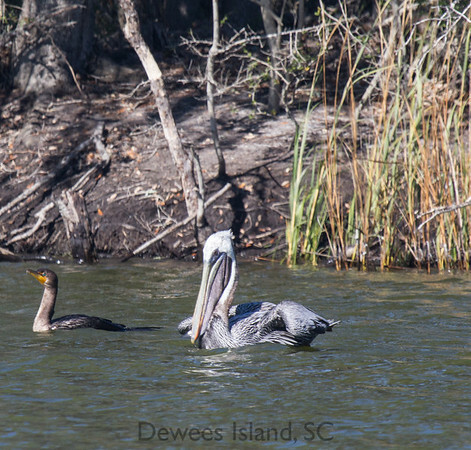 The pelican we are most likely to see on Dewees is the Eastern Brown Pelican. 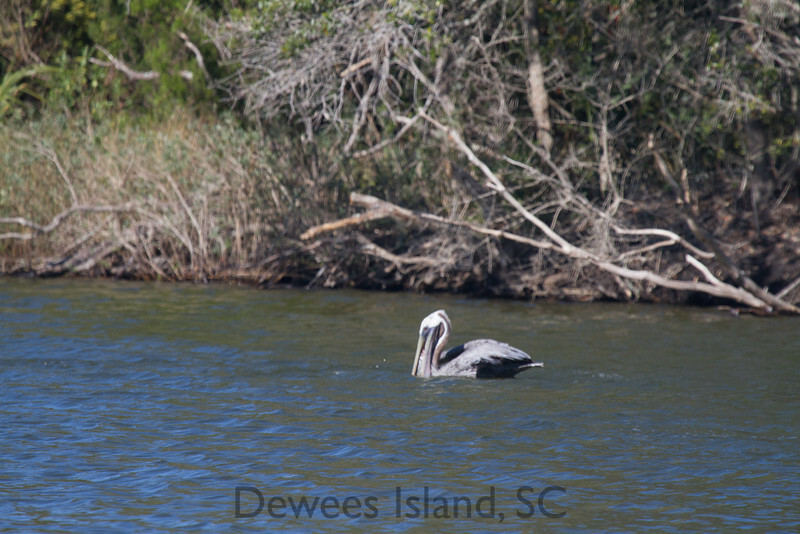 (Although we have seen White Pelicans on nearby Capers Island). It is the only pelican that feeds by plunge diving, and they can drop from great heights. 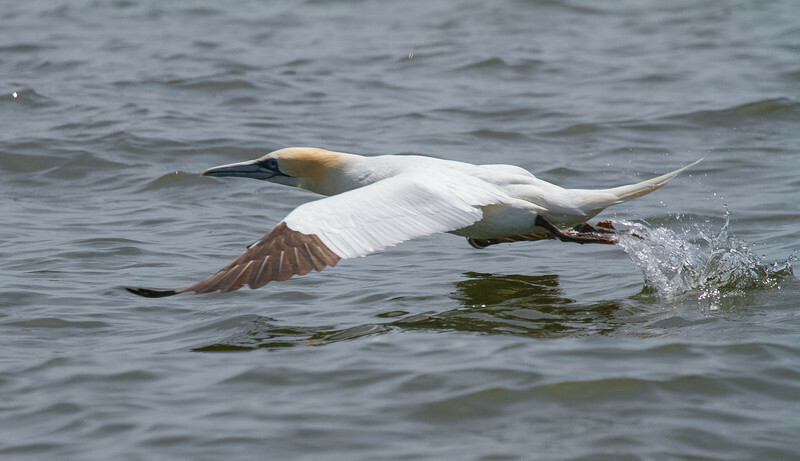 According to Birdscope at the Cornell Lab of Ornithology, Pelicans have several adaptations to diving, including air sacs beneath the skin on their breast that serve as cushions and floats. While diving, they also rotate their body to the left, probably to avoid injury to their trachea and esophagus, which are on the right side of neck. 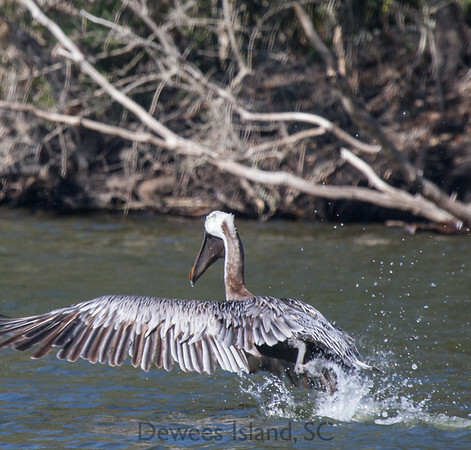 The eastern brown pelican was listed as an endangered species in 1970, when their population plummeted to less than 100. Widespread use of pesticides such as DDT caused thinning of eggshells, which subsequently broke during incubation. 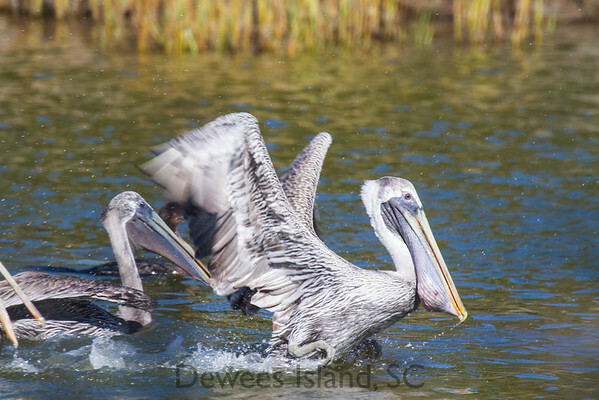 The United States ban on DDT in 1972 and similar pesticides spurred the pelican’s recovery to much of its former range. 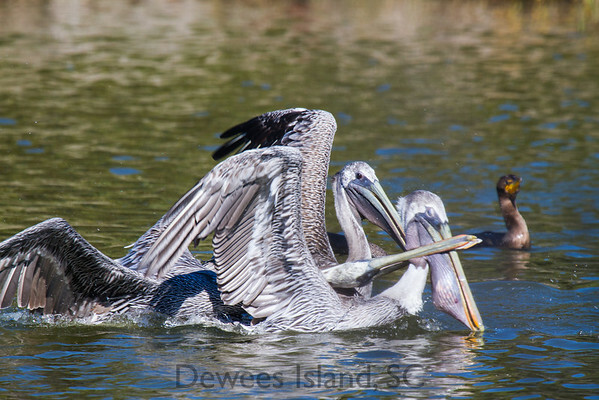 The implementation of the Brown Pelican Recovery Plan of 1979 also contributed to the restoration of brown pelican populations. 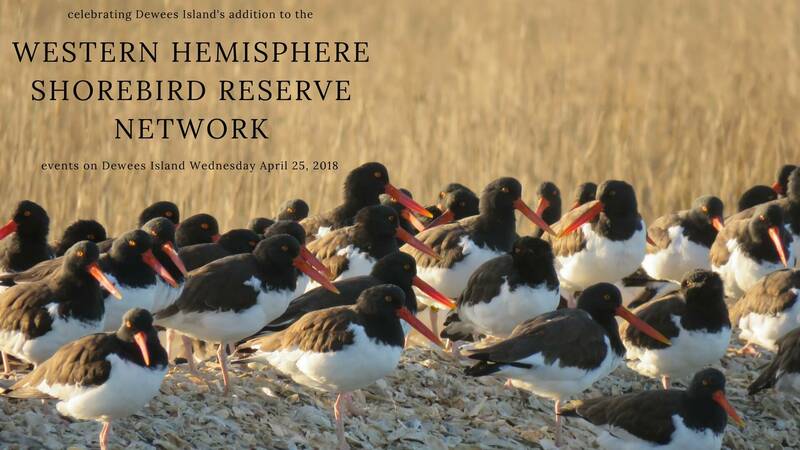 (SCDNR) Now they’ve had such a spectacular comeback that they’ve become a symbol of wildlife conservation, and they’ve been delisted from the endangered species list. 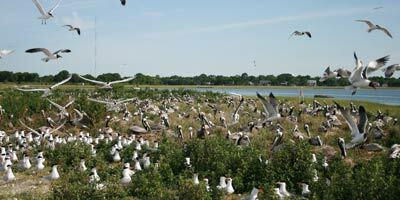 The pelicans we see on the island probably nested at nearby Crab Bank , with large colonies of other pelicans and other colonial nesters, like terns and black skimmers. They are strong swimmers, with webbing between all four toes. Their colors are brighter in breeding season, when they have one monogamous partner for the whole of the breeding season. 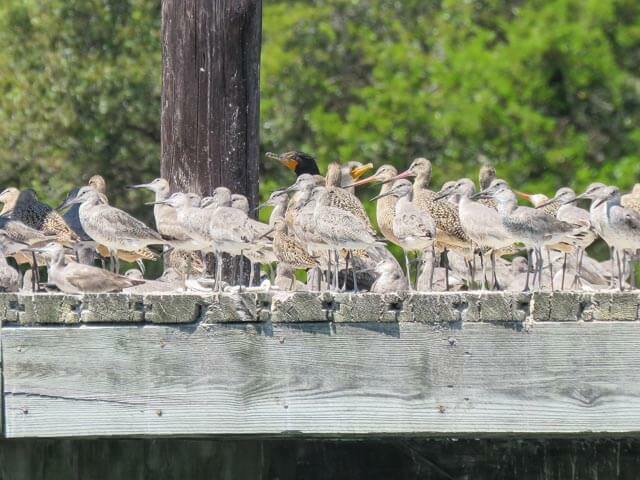 Juveniles are brown with a white belly, and it takes three years for them to change to adult plumage. Another unique feature is the hook at the tip of the pelican’s upper mandible (the top half of its bill), which helps grab onto particularly slippery or wiggly fish. After locating and scooping up its prey, the pelican opens its bill and slowly contracts its pouch to empty out the water and keep the fish inside. 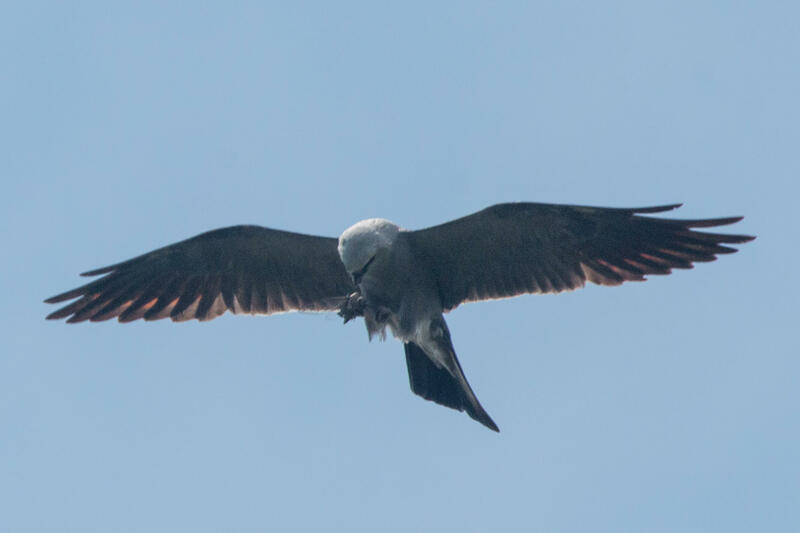 Then, with a jerk of the bird’s head, the fish slides down the ­hatch. 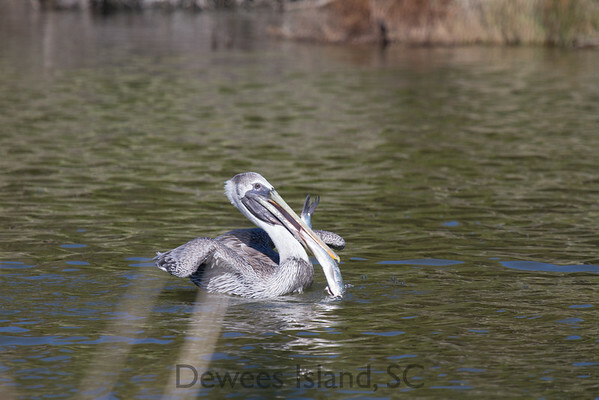 If a fish is particularly large, the pelican might manipulate it so that the fish goes down head first, which helps keep it from getting stuck. 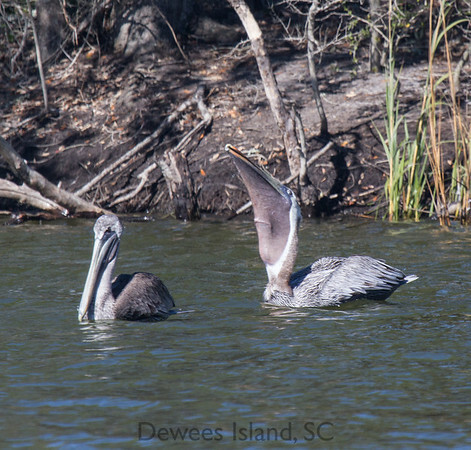 A pelican can’t eat or fly away if its pouch is still full of water, so the draining process is very important. By bending its neck, it can even turn its pouch inside out. They can also soar right above the surface of the water, using the slight updrafts from the wave troughs in a process called dynamic soaring. This allows them to save energy as they fly. This juvenile clown was fishing from slightly above the surface in Chapel Pond. and try to wash the fish down with water. and he finally moves on after somehow washing the fish down. 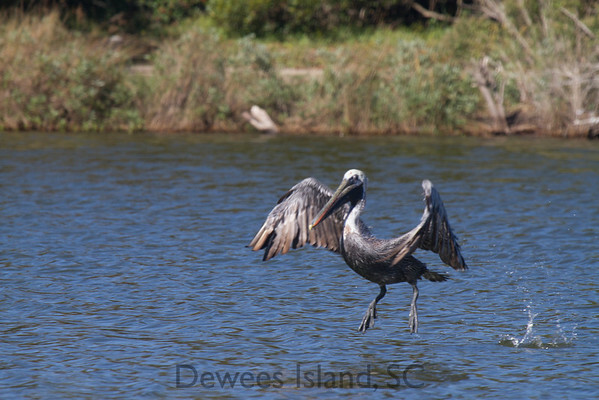 Here is a related post about releasing a Pelican after rehabilitation. At a workshop at the South Carolina Aquarium, I told the story of watching this pelican, and wondering if the pouch could withstand all that action. 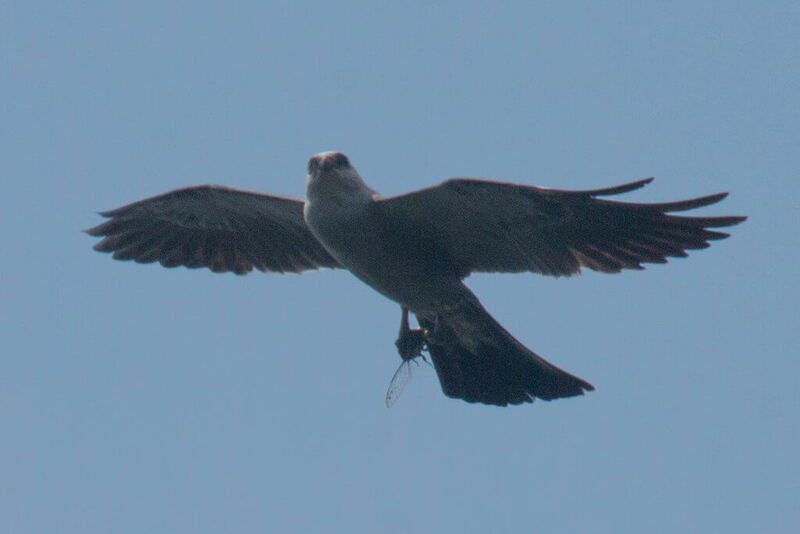 The bird rehabilitation specialists told me that the bird was lucky– if he (or one of his exuberant friends) had punctured the gular pouch, there is almost nothing that can be done for them– sutures won’t hold, and trying to repair a tear actually makes the situation worse. Most birds with gular pouch punctures have to be euthanized. So I was glad to see this guy finally move along! Last weekend, when the Pro-Birder conference took place on Dewees, I was delighted to receive a gift from Instructor Drew Lanham. 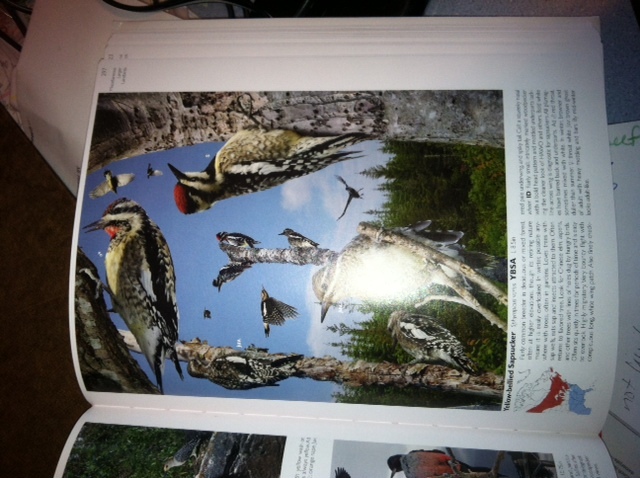 I had been admiring this field guide all day, because it is entirely photographic, and does a lot to show birds from a variety of angles in a variety of settings. 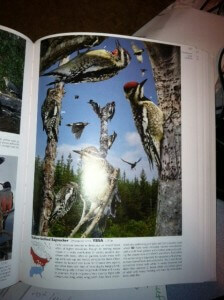 The Crossley field guide to Eastern Birds is a great new sort of reference book. The photographer/author uses lots of pictures of each species, photoshopped against a natural habitat, to give you a clear picture of each bird. Another fascinating field guide, this time about butterflies, was introduced to me by Lori Sheridan Wilson, island ecologist. 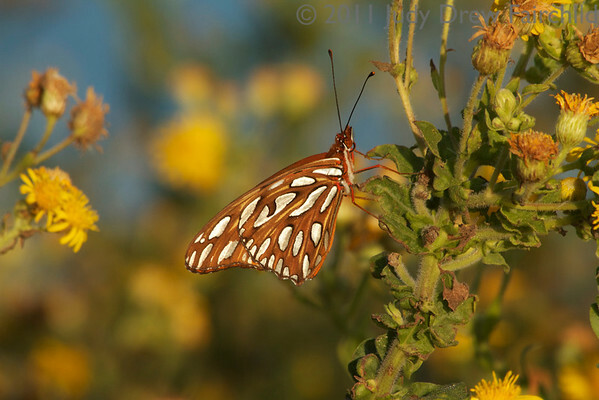 Butterflies through Binoculars has more than just identification tips: it shows you what the host plants are for different butterflies, and explains when and where you are likely to find them. And the third great find is Living Beaches of the Carolinas. This book has a treasure trove of information about the creatures you are likely to find in our tidepools. It’s a great reference for anyone who loves beachcombing and wonders about the shells and animals you find there!